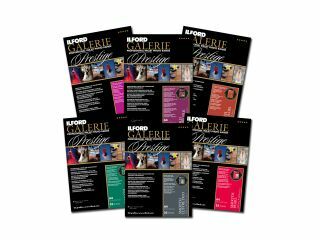 Ilford, the developer and manufacturer of professional quality paper for inkjet printing and colour photographic processes has announced that it rebranding the popular Ilford Galerie range. The range will now be called the Ilford Galerie Prestige (5*) and will be found in redesigned packaging. For the moment, the paper itself will retain the same qualities, but the rebranding is also in anticipation of new product additions throughout 2012. The new products are said to combine state-of-the-art inkjet technology with artistic styles. Additionally, the Galerie range has also introduced a star-rating system which enables professionals and consumers to quickly recognise the product. The Galerie Prestige (5*) is developed for professional photographers and imaging professionals. It features a specialty coating which promises superior images when used with a wide array of printers. The range includes Gold Fibre Silk, Smooth Pearl, Smooth Gloss, Smooth Fine Art and Smooth Lustre Duo in its ine-up. Photographers can download ICC profiles to help guarantee exact prints when using Ilford papers from the Ilford website. This includes a step-by-step guide on printer settings that have been created by technicians on the company's research team.